Katherine Gehl says, “I like to say I’m politically homeless.” It was clear at an “On the Issues with Mike Gousha” program at Marquette Law School on Wednesday that she does not use that label because she is not involved. In fact, the opposite is true: She is deeply involved. Her sense of “homelessness” comes from her frustration with what she calls “the political-industry complex.” The two major parties, Congress, the executive branch, Washington lobbyists, and the national media are all thriving, but they are not producing solutions to the nation’s problems, Gehl said. And while Washington thrives, problems go unsolved and people grow increasingly dissatisfied. She said the system and particularly the two major political parties do not have the incentives businesses have to respond constructively to competition. “Two parties equals zero results,” she said. 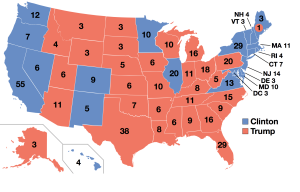 I have been working on elections since 2000, when I helped organize a team to defend a potential recount of Wisconsin’s narrow victory for Al Gore (never happened; see Bush v. Gore). Since 2004, I have trained thousands of attorneys to observe at polling places to ensure every eligible voter is allowed to cast a regular ballot. 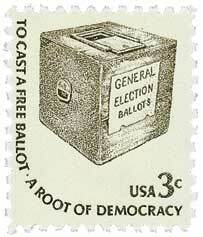 That is, and should be, the only goal of our election laws: enfranchisement! In 2005 I testified before Congress about Wisconsin’s voting laws, the lack of any actual voter fraud, and the many real administrative problems caused by running a national election in one day. In subsequent years, I helped compile reports of Election Day issues, defended individuals accused of voting irregularities, and was part of the GAB committee to create formal rules for observers. So, I have some background in election law. To put it mildly, I was surprised to hear a candidate for President state: “Voter fraud is very, very common.” Not just common, but VERY, VERY common. The statement, if meant to suggest rampant fraudulent voting, is categorically false. Fraudulent conduct by voters is exceedingly rare. A comprehensive study published in 2014 confirmed 31 cases of in-person voter fraud from 2000 to 2014, out of more than a billion votes. In stark numerical terms, that is one act of fraud for every 32 million votes. When defending Wisconsin’s harsh Voter ID law, the State “could not point to a single instance of known voter impersonation occurring in Wisconsin at any time in the recent past.” Frank v. Walker. In other words, voter fraud is very, very, very uncommon. Tomorrow is Election Day. It’s important to vote, so make sure you know where and when you can cast your ballot. 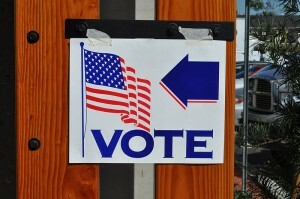 New for Wisconsin voters this year is a photo identification requirement. I break down the voting process below to demystify and clarify it. The Wisconsin Elections Commission is less than four months old and so far it has made only two major decisions, each supported by all six members. Will the new body, created to take over the election oversight role previously played by the state’s Government Accountability Board, be a steady and responsible force for conducting elections well and avoid partisan divisions? During an “On the Issues with Mike Gousha” program Wednesday (Oct. 26, 2016), two of the leaders of the commission conveyed a message of professionalism and commitment to doing the jobs well . They also expressed general confidence in the quality of election practices in Wisconsin. By: Jacques CondonPosted on October 26, 2016 Categories Constitutional Law, Election Law, Legal History, Political Processes & Rhetoric, Public1 Comment on How Did We Get Here? Part Six of a Six Part series on Election Law, providing context to our system of government, our election process and a little history to evaluate and consider in the candidate-debate. 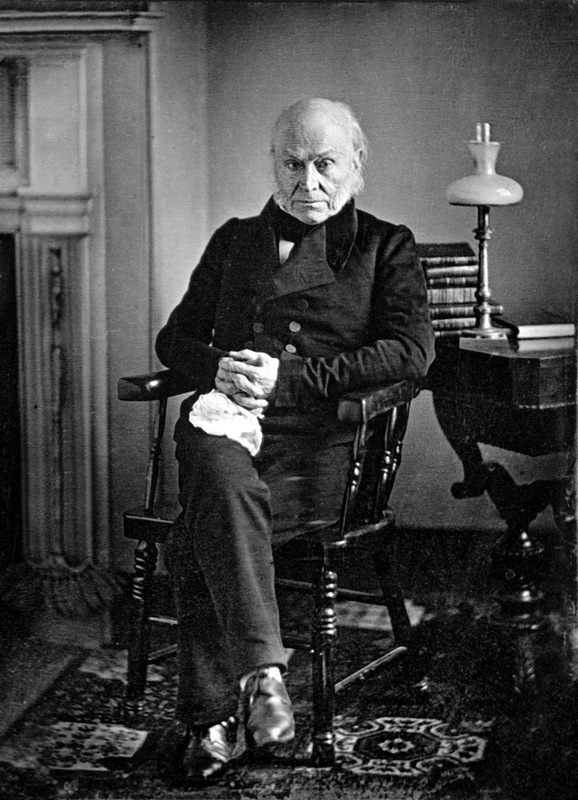 In an age where the presidential vote is relatively close, a two-party system dominates politics, and the average voter recognizes that voting for an independent/splinter candidate has no real shot at electoral success, is this really what the framers intended in 1787 when drafting the Constitution of the United States? Not only was the Electoral College system problematic almost from the moment it left the starting block, but the election process has grown more complicated, more winner-takes-all, and more divisive than perhaps the delegates could ever have imagined. 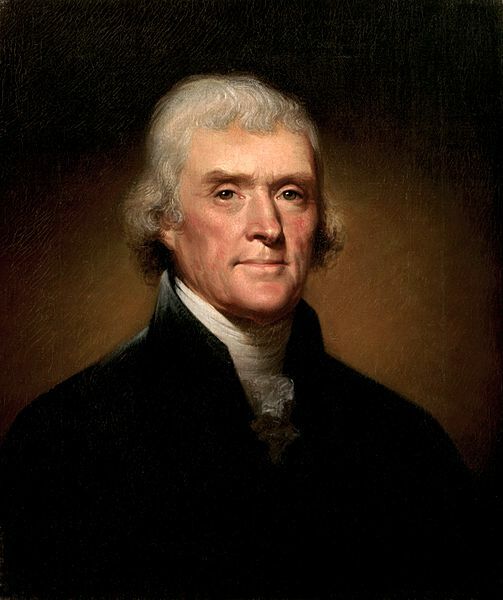 Does Jefferson’s report of a political divide — in 1797! — sound familiar when looking at today’s election debate? On October 20, I had the honor of moderating a panel discussion at the Law School devoted to Voting Rights Litigation in Wisconsin. 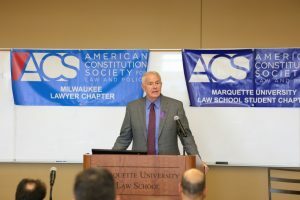 The event was co-sponsored by the Marquette University Law School Student Chapter of the American Constitution Society and the Milwaukee Chapter of the American Constitution Society (ACS). A crowd of approximately 60 persons witnessed a lively presentation on the right to vote under the U.S. Constitution, recent legislation in Wisconsin that places burdens on the ability of some people to vote in our State, and the status of litigation in the federal courts challenging these state laws. The event began with a welcome from the Chair of the Milwaukee Chapter of the ACS, Attorney Craig Mastantuono. Attorney Mastantuono began with a description of the mission of the American Constitution Society and the benefits of membership. He also noted the excellent timing of the day’s event, given the attention currently being given to the integrity of the American voting system. Then Attorney Mastantuono introduced the Mayor of Milwaukee, the Honorable Tom Barrett. Part Four of a Six Part ser ies on Election Law, providing context to our system of government, our election process and a little history to evaluate and consider in the candidate-debate. Prior blog posts mentioned party-politics as having emerged during the Constitutional debate — in the framing days of the late eighteenth century, delegates began aligning along federalist and anti-federalist divides. Alignment shaped the compromise that became the Constitution of the United States, with the process of choosing the President — indirectly through electors — an example of compromise at work. The compromised solution was complicated. Rather than allowing election by the populous or allowing Congress to choose the position, each state was given a number of “electors” and these electors would vote for the President. Each state was left to determine the manner of selecting their electors, thus allowing the states a role in choosing the president. The electors would choose the president on the same day, all in an effort to even the playing field, as it were, in election and governance. So how did it work, at least initially? Whom Do I Want As My King? By: Jacques CondonPosted on October 15, 2016 October 30, 2016 Categories Constitutional Law, Election Law, Legal History, Political Processes & Rhetoric, Public, Uncategorized1 Comment on Whom Do I Want As My King? Part Three of a series on Election Law, providing context to our system of government, our election process and a little history to evaluate and consider in the candidate-debate. Prior blog posts discussed the lead-up to the Constitutional Convention of 1787 and provided context to the debate over the American system of government. Here is further context. 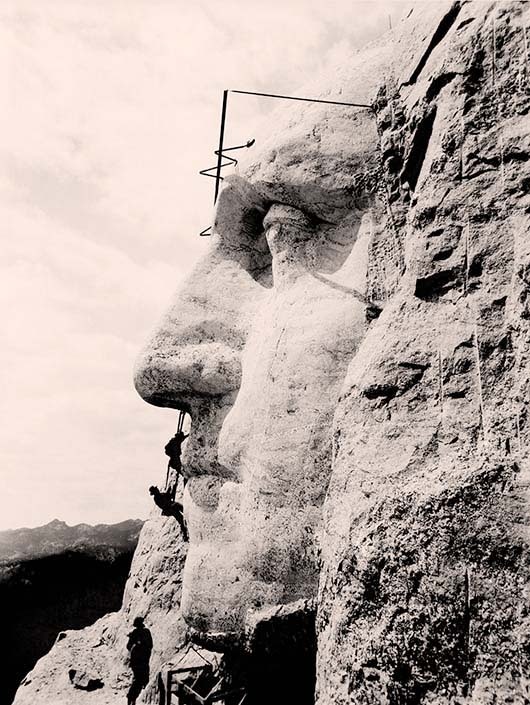 For a more in depth discussion and a great read — upon which much of this blog finds its genesis — look to Ray Raphael’s book Mr. President: How and Why the Founders Created a Chief Executive (2012). I begin with the delegates. Think of it like this: If you were a wealthy American landowner in the late eighteenth century, and held a position of prominence for some time, you probably wanted to ensure that, whatever government governed, your status remained unchanged. 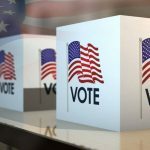 Should not your vote count a little more than someone else? Can we really let the people select of our elected officials? On these basic questions the delegates to the Constitutional Convention were either conflicted, or outright opposed. As Roger Sherman, the representative from Connecticut proclaimed, “The people immediately should have as little to do as may be about the government. They want information and are constantly liable to be misled.” On the flip side was Alexander Hamilton who touted the “genius of the people” in qualifying the electorate. Basically, even if a Constitutional Convention delegate agreed to a national government and an “executive branch” to that government, he still had open questions as to what should it look like, how much power it would have, and who would decide the person/persons for such an office. So how did the delegates get from point A to point B? 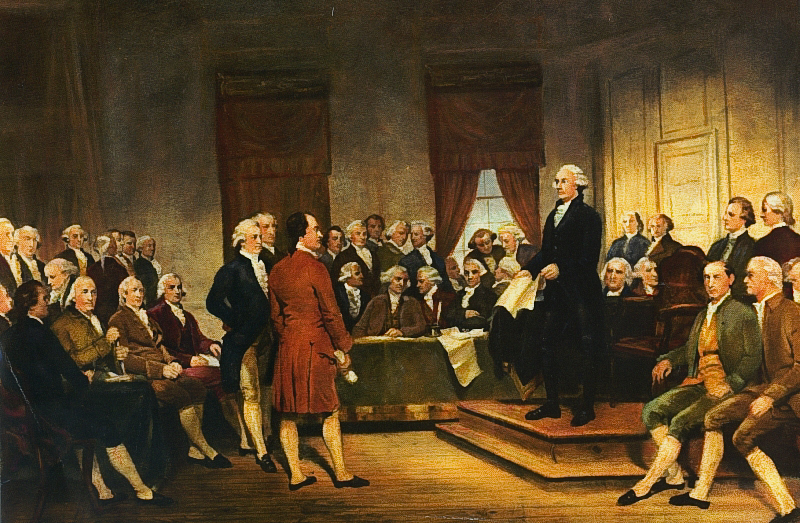 First, the delegates took the unusual move of calling for secrecy in their debates, something unheard of then and which continues to be a source of confounding discussion even in today’s society; in 1787, and as often argued today, the delegates wanted the freedom to speak freely.